NintenGen: Revolution revealed in the next Nintendo Power? Revolution revealed in the next Nintendo Power? It looks like what ever will be on the cover of the June Nintendo Power(released in April) will have the biggest news yet this year for Nintendo fans. What would the biggest news be? I would think that everyone who's any Nintendo fan knows that the biggest news we all want is the inside scoop on the Revolution. 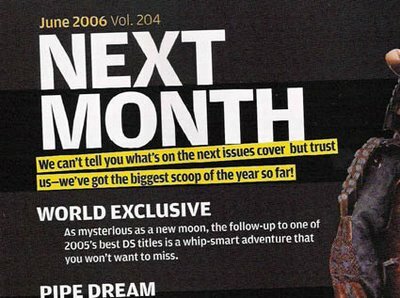 As you can see in the picture, the big news on the cover of the magazine will be different from the DS news that is mentioned right below. The DS is great but we know that the big news is with the Revolution. Matt from IGN said that we would "see" some games on Revolution before E3. It looks like this is the best bet yet. of course, we shall see. Take a look at the latest Nintendo Power in the "next month" section if you want to see this picture for yourself.